In summary, recent survey data show that Guatemalans experience high levels of corruption victimization, have fairly cynical views of the proportion of politicians who are corrupt, hold the CICIG in very high regard, have moderate levels of trust in the Constitutional Court, and fairly high levels of trust in the MP. In such a climate, attempts by President Morales to defy the CICIG, the Constitutional Court, and/or the MP may risk running afoul of the court of public opinion. This is on the verge of being a hypothesis. If the public gains trust in state institutions intended to fight corruption, that can have an impact (in what exact manner, I don't know) on political efforts to undermine those institutions. At this point we'll just have to read the news to watch how that public trust translates into pressure on the president. But as important as international condemnation is, collective pressure thus far has failed to have a critical role in triggering a democratic transition and will continue to do so, especially if political will in Venezuela remains challenged by just a few in power. The international community has limited influence over an autocratic regime that has no intentions of democratizing or yielding its absolute control of national wealth, at least not in the remainder of 2017. It's useful to read Elías Jaua's opinion piece in TeleSur along with it. He basically argues for a fully Cuban-style system, with state control over all distribution of income, instilling Communist military doctrine both in the military and society, and other similar measures. This he calls "liberation." And indeed, this is the direction Venezuela will likely take, or at the very least the direction Nicolás Maduro will attempt to take. We have seen already that the government will not engage in meaningful dialogue (with "meaningful" involving concessions or acceptance of the opposition's legitimate right to political power), that the opposition can't seem to unite, and that Latin America will not unite in condemnation. That gives Maduro political space, and expanding the state's control over society is the logical step for the intransigent, especially when resources are becoming scarcer. Cañiláz's article mostly hopes for more defections and increased youth disaffection, but will they matter as the state increases its control? The new information paints a picture of an American government with no single policy, but rather, of bloated bureaucracies acting on competing interests. Hidden actors during the crisis tilted Honduras toward chaos, undermined official U.S. policy after the coup, and ushered in a new era of militarization that has left a trail of violence and repression in its wake. At the time, I wrote about how then-Senator Jim DeMint clashed with John Kerry. As Johnston notes, along with Connie Mack, DeMint was working actively in favor of the Honduran military. Meanwhile, Hillary Clinton and Barack Obama's own perceptions of the coup (specifically whether to call it a coup) diverged. Further, despite all the human rights talk, U.S. military aid starting flowing in not long after the 2009 presidential election, and abuses worsened. Johnston's narrative shows how the Honduran coup plotters were looking for positive signals from the United States (an issue that Kathryn Sikkink discusses in her book Mixed Signals, which I am actually using right now in my U.S.-Latin American relations seminar). According to Johnston's account, they went looking in particular at the Center for Hemispheric Defense Studies, where they got an informal positive sense. It's hard to believe they took that as official approval, but if it happened then they certainly would've been heartened. They also knew for sure that they would find strong congressional support in the U.S. Overall, though, Johnston's main thesis as stated above is critical. As we all saw at the time, U.S. policy veered around and a multitude of voices said contradictory things. President Obama would sometimes make clear statements but they wouldn't be followed with action. Unfortunately, and I also noted this at the time, Latin America waited for the U.S. to take the lead, with even Hugo Chávez begging Obama to do something! In the midst of that mess, the coup government was able to wait things out and Honduran democracy, such as it was, suffered. The UN Human Rights Office issued a report citing "extensive human rights violations and abuses" in Venezuela. Here's the full text. Credible and consistent accounts of victims and witnesses indicate that security forces systematically used excessive force to deter demonstrations, crush dissent and instil fear. The report also rejects the whole "economic war" and "both sides are equally responsible" government line. Starting in 2014, the Bolivarian Republic of Venezuela has experienced an aggravation in the economic crisis derived from the drop in the international price of oil and other factors such as currency and price controls, lack of investment in infrastructure and in the production system, and the heavy dependency on oil revenues to import basic goods. What a change. Hugo Chávez loved the UN as a forum to rail against the United States (like his famous 2005 speech). He worked the rooms at UN meetings. Now Venezuela is becoming a pariah. As you might guess, the report calls on the government to start respecting Venezuelans' rights. Instead, the opposite is happening, as the Constituent Assembly issued a decree allowing opposition leaders who support sanctions to be arrested. We'll see more such decrees in the days to come, often created quickly in response to events on the ground to allow for wider arrests and repression. The Ejército de Liberación Nacional (ELN) attacked an oil pipeline in Colombia, which compelled the government to shut it off. The ELN has been in talks with the government and this sort of attack is intended to put pressure on President Santos to make more concessions. This is a tricky move because the ELN will also need to prove it can stop being violent. In July 2015, for example, the FARC announced a unilateral ceasefire, which almost certainly helped get to the peace negotiation finish line (the ceasefire became bilateral in August 2016). There had been talk that the ELN would do the same to coincide with the Pope's visit, so I guess they figure they should get some bombings in beforehand to remind the government of their strength. Meanwhile, the hypocrisy of bombing pipelines is evident. The ELN claims to be on the side of the rural poor, while ensuring that raw oil periodically gets spilled in rural areas. All those spills mean woe for farmers, those who rely on fishing, etc. Mexico will not negotiate NAFTA, nor any other aspect of the bilateral relationship, through social media or any other news platform. And indeed, Trump's statements are intended to achieve two goals. The first is to intimidate Mexico with a hard line, which Trump actually appears to believe strengthens his bargaining position. I suppose it must've worked sometimes in real estate for him to keep trying it. The second is to send his core xenophobic supporters the message that he still dislikes Mexico and Mexicans. He's gone all over the map about who would pay for the wall, but those people want to hear that Mexico is a nasty place and its nasty people will pay so periodically he reassures them on that point. Karl Ove Knausgaard's Autumn is not part of his My Struggle sextet (the last of which does not come out in English until next year) but it's the next best thing. It is a series of short essays and letters to his unborn daughter, emphasizing the beautiful (he uses that word a lot, too much really) in ordinary things. Toilets, wasps, chewing gum, you name it. He's so good at making the ordinary interesting that I liked them despite how mundane they sound. The chapters all wonder about how we relate to the world, even how our bodies open up to it. The stars are out tonight. I was just outside taking a leak on the lawn, something I do only when everyone is asleep and I'm alone (p. 85). No context, nothing. That's how he rolls. Yet at the same time he is so earnest. He loves his children dearly and wants to explain the world--all of it--to them. The Venezuelan government did a study of front page news in foreign newspapers and complains that Nicolás Maduro's rambling press conference did not receive much coverage. Instead, papers focused on Trump's military comments and Luisa Ortega's flight from the country. They conclude that this is the result of censorship and hegemony. It's more accurate to say that the latter two issues are actually news, whereas Maduro repeating himself is not. We heard nothing new at the press conference, except for the normal vague pronouncements and not-credible assertions of being ready for sanctions. From a PR perspective, this is such a big difference between Maduro and Hugo Chávez. Maduro is boring and rarely has anything new to say. Chávez suffered from neither. Beginning October 1, Panama will require a visa of all Venezuelans entering the country. President Varela and Mike Pence had already mentioned it during this joint remarks a few days ago. Over the next few days, Panama will take measures which support the return of democratic order in Venezuela and strengthen our internal security together with migratory measures, always within the framework of respecting human rights of migrants. I assume the measure is intended to stem the flow of money laundering being done by Venezuelan government officials. which will accelerate if the regime starts to crumble. Panama has already accused Venezuelan Vice President Tareck al Aissami of being involved. Haltingly and cautiously, Latin American governments are making statements and taking action. 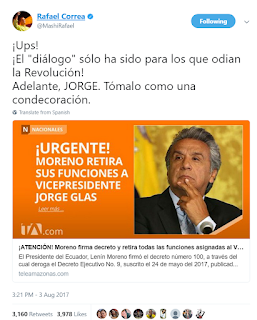 Lenín Moreno recently acknowledged and expressed his concern about political prisoners in Venezuela. It's a big deal for a leftist president to publicly state that the Maduro government is throwing people in prison simply for their political beliefs. So there's no unity yet (my dire prediction back in March still holds true) but there's movement. I'm quoted in this story about how Mike Pence's visit to Latin America failed to get any regional backing for U.S. policy toward North Korea. My main points were that Latin American leaders want to make 100% sure no one believes they support Donald Trump's stance on North Korea; and that they do not want to talk about North Korea. It's just tone deaf, and is reminiscent of George W. Bush's bullying tactics during the debate over the Iraq invasion in 2003. They backfired, relations were set back, and they never recovered. Latin America is not a place to find support for war or aggression, and leaders want the U.S. to acknowledge the issues they find pressing. North Korea is not on the foreign policy radar, and trying to push it there just strengthens the impression that the Trump administration has no interest in Latin America. According to Delcy Rodriguez (and repeated uncritically by state media in English) the Venezuelan legislature was not dissolved. You imperialists keep repeating such nonsense. Instead, there appear to be two main points. The constituent assembly (ANC) only took some, not all, of the legislative duties. So no biggie. And you claim to want dialogue, yet we offered to make a big federal legislative unit where your deputies can work with the ANC while exerting no real power, but you refused. We have to remember, she said, that Venezuela is in the middle of "institutional reorganization" where by the ANC has "absolutely faculties" to achieve "reorganization of the state." You know, for peace. A new report from the Economic Commission for Latin America and the Caribbean shows that Foreign Direct Investment in Latin America dropped. It feel 17% from 2011. But in all this, some good news. The end of the commodity boom has had some positive effects. After the end of the commodity price boom, investment in extractive industries slowed and this sector’s share of FDI has been falling since 2010, down to 13% of the total in 2016. By contrast, the share of manufactures and services increased to 40% and 47%, respectively. The new investments announced were concentrated in renewable energies, telecommunications and the automotive industry, with the region receiving 17%, 21% and 20%, respectively, of overall investment. Meanwhile, for a second year in a row, the renewable energy sector attracted the most investment, receiving 18% of the total announced for the region, with a third of those investments going each to Chile and Mexico. Of course, those industries need investment, and it's up to governments to find creative ways to attract it. The report talks about a "revolution" in the automobile industry. As Europe moves to end the combustion engine and people in the U.S. think more about electric cars, this is obviously a critical time for strategic change. And, as the report notes, cars have increasingly sophisticated computer systems, and Latin America needs to produce the necessary engineers. It goes without saying that screwing with NAFTA puts all this in jeopardy. Housekeeping vs. the Dirt is the second collection of Nick Hornby book review essays that I've read (the other was The Polysyllabic Spree, which I see I thought was less funny than he thought. I didn't get that type of impression this time). I find these books irresistible because he's a great writer, is not at all pompous about the books, and embraces the idea of being spontaneous about buying books but then reading according to mood. In fact, reading him makes me add stuff to my Amazon list that I may or may not ever buy or read. In Episode 39 of Understanding Latin American Politics: The Podcast, I talk with Steven Hyland, an assistant professor in the Department of History and Political Science at Wingate University. He specializes in modern Argentina and international migration. He has a new book coming out entitled More Argentine Than You:Arab-Speaking Immigrants in Argentina with University of New Mexico Press. We discuss Muslim immigration to Argentina how that fit with Peronism, and broader patterns across Latin America. I have a post up at Global Americans, trying to explain the contradictions of the Trump Doctrine in Latin America, and how Mike Pence and others have to spend time explaining to foreign leaders that they need to ignore his boss. My take on the Trump Doctrine. Indeed, at least to this point the “Trump Doctrine” in Latin America has two essential elements: first, strong and sometimes bellicose rhetorical opposition to the Obama Administration’s policies; second, significant substantive continuity with Obama Administration policies combined with threats to change that fact. It happened that Mike Pence went first to Colombia for his Latin America visit, so it was up to Juan Manuel Santos to tell him that Donald Trump's comments on Venezuela were counterproductive. Santos said no Latin America country would accept any form of U.S. military intervention in Venezuela and that it should never even be considered. Recalling more than a century of U.S. military action throughout Latin America, Santos said no Latin leader wants "that phantom" to reappear. There's an important point here. Trump supporters (or those playing devil's advocate) say that of course every option is on the table, that's true for all presidents, and Trump was just stating the obvious. But Santos is pointing out that in Latin America the military option should remain off the table. It won't work as planned and is not credible. Remember, that's coming from an ally. And ideologically, Santos is not one to harp on U.S. intervention, given how deeply involved the U.S. government was with Plan Colombia. In other words, the Trump administration needs to make sure it's listening. Instead, as I noted two days ago, the administration is insisting on treating the situation as bilateral. Earlier Sunday, CIA Director Mike Pompeo told Fox News Sunday that Trump talked about the possibility of military action to "give the Venezuelan people hope and opportunity to create a situation where democracy can be restored. The only "opportunity" will come with multilateral pressure. The only way to generate multilateral pressure is to avoid inflammatory statements. Coalitions are hard to construct and they require a lot of keeping your diplomatic mouth shut. Will Englund's March 1917 covers the events of that month that culminated with Woodrow Wilson asking Congress to declare war and enter World War I. He's a good writer and especially in the second half he narrates the tension that led up to Wilson's speech (which actually was not in March). The disparate figures in the book, from Wilson to musician James Europe, first female member of Congress Jeanette Rankin, journalist H.L. Mencken, and a number of others, don't always add up to any particular whole. People were doing stuff, even interesting stuff, as the country lurched toward war. Some were influential, some were not. So I think the book is trying to get at mood more than anything else. One element of the book that is worth pondering is how World War I gave Americans more of a sense than ever that they were messianic saviors of the world. The messianic part had always been there*, but the war made it truly global. We've suffered a lot as a country as a result because it is applied so broadly. * On this point, read Brian Loveman's No Higher Law. I have a piece in the Georgetown Journal of International Affairs that just came out about U.S. policy toward Latin America. More specifically, it examines the effectiveness of soft power versus hard power. Coincidentally, shortly after it came out Donald Trump announced that a "military option" was not off the table for Venezuela. This is Trump's "deal making," whereby he blusters to appear tough and then backs down. I suppose he believes such a statement will frighten the Venezuelan government to the bargaining table. I am one of many who argued that doing this was a gift to Nicolás Maduro, who can use it to whip up nationalist sentiment. Chavistas who are wavering will find it harder to pull away when he talks like this. But it was also unfortunate because Trump seems to be claiming that the Venezuela situation is somehow bilateral. It makes diplomacy more difficult, to the extent that the Trump administration cares. Allies in the region such as Mexico, Colombia, and Peru, all came out against the statement. It makes a multilateral solution even more challenging, and it was painfully difficult to begin with. Henrique Capriles hasn't said anything, except to retweet the U.S. Defense Department's statement that it didn't know anything, and in general the opposition isn't talking. That's unfortunate. Perhaps they want to be careful about offending Trump, since they like how he keeps Venezuela in the headlines. Trump is a vain man who pays attention to those who criticize him. Several months ago, I noted that Trump was doing little with Venezuela and that was a good thing. It is likely he will continue doing little, but there comes a point when the "walking loudly" is counter-productive. A group of U.S. senators seem not to understand leverage. They are publicly asking Donald Trump not to impose sanctions on the Venezuelan oil industry, arguing (correctly, in my opinion) that such a move would hurt U.S. refiners and would push Venezuela more toward China and Russia. Right now, a chunk of the U.S. economy is dependent on the continued flow of Venezuelan oil. As a result, no U.S. president has seriously contemplated stopping it. That means the economic ties do not generate any leverage. If anything, they do the opposite--Nicolás Maduro and the Constituent Assembly can feel reasonably confident that their actions will not be punished beyond the individual sanctions, which don't have much impact. The idea that the U.S. could "deliver a democratic government back to the people" is both insulting and incorrect. The U.S. won't have much to do with the solution to the Venezuelan crisis as long as it fails to forge a multilateral solution, which right now it appears not to be doing. When I've been asked about the effects of immigration reform, one answer I always give is that prices will increase. One reason produce is so cheap, for example, is that undocumented workers are being paid very low wages. Since picking fruits and vegetables is so taxing, if all workers are legal then farmers will have to raise wages significantly. In California we're seeing a problematic wrinkle on this issue. In the absence of reform and in the context of harsh anti-immigrant policies, growers are offering higher wages and benefits but not getting takers. Farmers say they're having trouble hiring enough people to work during harvest season, causing some crops to rot before they can be picked. Already, the situation has triggered losses of more than $13 million in two California counties alone, according to NBC News. The ongoing battle about U.S. immigration policies is blamed for the shortage. The vast majority of California's farm workers are foreign born, with many coming from Mexico. However, the PEW Research Center reports more Mexicans are leaving the U.S. than coming here. This is the worst of all worlds. Crops rot, farmers get hit, workers don't have jobs, and prices go up. Update: Minneapolis Fed President tells employers to shut up, stop whining, and just raise wages higher. 9 days since constituent assembly vote. 4 days since it took power. Ninguna voluntad extraña puede conminar al Gobierno de Venezuela a tomar decisiones contrapuestas a sus intereses legítimos, ni a desconocer la voluntad general de su pueblo, que se ha expresado en las urnas a favor de instalar al Poder Constituyente. Ecuador is saying straight up that a clearly fraudulent process is the will of the people. This is a very nice boost for Nicolás Maduro. Bolivia and Ecuador can stand as serious obstacles in the OAS. * As a matter of fact, on Twitter he was talking about getting more foreign oil investment. 8 days since constituent assembly vote. 3 days since it took power. Henrique Capriles is reaching out to disaffected Chavistas. This is a good move that will broaden the opposition and shift its image. This won't be easy because those Chavistas hate Maduro, not Chávez. I would go even further and consider giving one of those leftists a prominent leadership role. The opposition has found it hard to shake accusations of privilege, of wanting to ignore the reasons Hugo Chávez came to power in the first place, of disregard for the poor. Leopoldo López can't be the face of a unified opposition. The "united" part would be for free elections only--I can't imagine such a thing morphing into a ruling coalition sometime later. Since Maduro is not allowing democratic change to occur, a broader opposition will serve as a signal both to Chavistas and the armed forces that the government is too unpopular to support. No doubt the opposition is putting out feelers to the military as well. Ideally, the combination of domestic and international pressure would force the government to engage in substantive dialogue, which would ultimately lead to elections. I am not holding my breath, but that's the hope. 7 days since constituent assembly vote, 2 day since it took power. A major question in Venezuela right now is what the rank and file military officers are thinking. They are the foundation of state power, and we do not know the extent of the gap between the generals and lower-ranking officers. Along these lines there was an attack on a military base in Carabobo state, which may or may not involve active duty officers but which is likely not to be the last example of rebellion. The state is eliminating all forms of legal political opposition (forcing out Luisa Ortega is the most obvious recent example), which means the opposition can only take to the streets and encourage military action. Closing out legal channels of dissent may well be the most dangerous thing the government is currently doing--the long-term effects will be violent and bad for everyone. As the violence increases, the government will need the army to quell dissent. That is where loyalty is sorely tested. The soldier on the street aiming his gun at fellow Venezuelans--not the general sitting in his air-conditioned office and driving a new imported car--is the one whose loyalty will matter. And the worse things get, the less you can count on it. John Farrell's Richard Nixon: The Life is a snappily written and well-documented biography. The tone can move toward disbelief and sarcasm here and there, but given the record of unethical, illegal, and downright stupid actions, that can perhaps be forgiven. The main attraction of the book is that Farrell does a tremendous job getting at the emotion, especially through the use of recorded interviews, notes, and the like regarding key moments. The Checkers speech was preceded by intense frustration and tension, with everyone wondering whether it would end with his announced resignation as VP candidate. The Pentagon Papers, which should've been a hit to LBJ and JFK, made him furious and so he lashed out. Watergate, of course, led to despair. There are a lot of great quotes, often related to Nixon's utter amorality or his extreme discomfort with other human beings. That emotional side also helps you see Nixon's gradual emotional decline. By the time he was president, it took almost nothing to set him off. Indeed, he knew he would give orders that shouldn't be carried out. He admitted it, which itself is insane for a president. But when you're surrounded by ideologues like Charles Colson, those orders will sometimes be followed. And he'll hire crazier people like Howard Hunt and G. Gordon Liddy. Farrell argues that Nixon hoped J. Edgar Hoover would do the dirty work, as he had periodically done for past presidents, but when he refused Nixon had to find his own people. As I read, I realized there was no mention of previous biographies until the end, no explanation of what niche this book fills. Not until the acknowledgments do we learn that he liked the past biographies but wrote it to include more sources (like oral histories, which help capture the emotion) and to be an accessible one-volume biography for people to read for the 50th anniversary of his 1968 election. Fair enough. 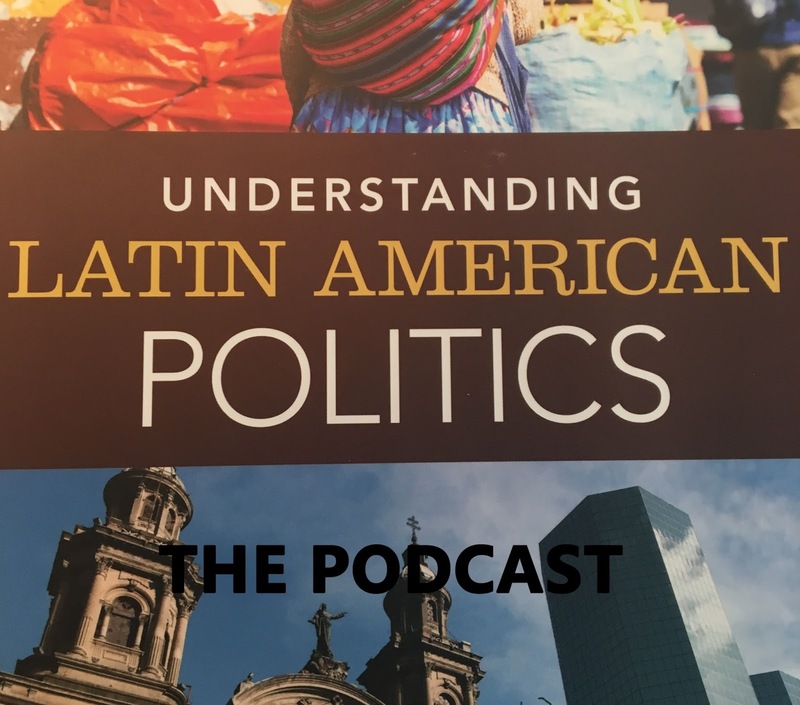 In Episode 38 of Understanding Latin American Politics: The Podcast, I talk with Mervyn Bain, who is Lecturer in Politics and International Relations and Head of School of Social Sciences at the University of Aberdeen. He has published extensively on the relationship between Russia and Cuba. Among other things, we discuss the continued strength of the relationship, the role of the United States, and what the future might hold. I find it particularly intriguing to think about how many Russians might feel angry if they felt they "lost" Cuba, just as Americans felt the same way half a century ago. Fascinating scene in Ecuador, where there is a leftist brawl, a mirror image of the conservative brawl in Colombia. Lenín Moreno stripped Vice President Jorge Glas of his authority because of corruption charges and because of Glas' criticisms, which prompted Rafael Correa to go off on Twitter. Get out your popcorn on this one. Glas is still VP but without any authority, which I have not heard of before, but he says he will not resign. The Alianza País party is in an uproar. The party released a statement on Twitter calling for unity and telling the "rancid" right this would not mean any change of platform or ideas. The Vice-President of the Republic, when not replacing the President of the Republic, shall perform the duties that the latter assigns him/her. What this means it that the Vice President has power only to the extent that the President assigns/delegates it. If the president assigns nothing, the VP does nothing even though he/she remains in office. Incidentally, this is yet another reason not to expect Ecuador to play much of a role in the Venezuela crisis. TeleSur notes that four countries support Venezuela's Constituent Assembly: China, Russia, Nicaragua, and Bolivia. Unwittingly, the article gives a long list of countries opposed but can only come up with four specific examples of supporters. (Oddly enough, they do not mention Cuba, which is unsurprisingly supportive). What this shows is how weak Venezuela's international position is. China's support is based on protecting its investments. The Chinese government made a statement that the voting was "generally held smoothly," which helped boost Venezuela's bonds. Last year China indicated it did not want to throw good money after bad, and it does not want default. Therefore it does not want unpredictable regime change. Russia's support is based largely on poking the United States. Russia has a long diplomatic relationship with Venezuela, which has fueled countless conspiracy theories, but for the most part it's a reminder to the United States that Russia is present in its back yard (with the obvious message that the U.S. should stay out of Russia's). At the same time, Russian companies are also exposed in Venezuela and so do not want more upheaval. Neither country will stick its neck out for Nicolás Maduro, and China in particular just wants reassurance about its investments. Nicaragua's support is Daniel Ortega's ingenious ability to support everything. He talks stridently about imperialism while working closely with the U.S. government. He can be counted on to stick with Maduro all the way, but would also be ready to work with anyone. He will not sacrifice much for Maduro. Evo Morales, meanwhile, is a true believer. He can be trusted to support Maduro to the hilt and blame all troubles on the U.S. He is one of the last of the leftist leaders who swept in over a decade ago still in office, and seems to see himself as the standard bearer of that era. Conspicuous by its absence here is Ecuador. Rafael Correa was a vocal leftist internationalist but Lenín Moreno is not, which is partly why they're beginning a Juan Manuel Santos/Alvaro Uribe type of feud. Moreno tends to keep his mouth shut about Venezuela, and definitely is not providing support. Overall, this is shallow support. Evo Morales is the key, as he can work the smaller countries in the hemisphere to reduce any majority in the OAS. Cuba is not particularly relevant diplomatically, and the rest will not stick their necks out too far. There was a hearing today on the Colombia peace process before the Senate Subcommittee on Western Hemisphere, Transnational Crime, Civilian Security, Democracy, Human Rights, and Global Women's Issues. What's especially notable is that there is a diverse group of people giving testimony and two of them are the current front runners for the important Assistant Secretary of State for Western Hemisphere Affairs position (William Brownfield and Francisco Palmieri, who is currently the interim). But all agree that the U.S. needs to stay committed to promoting the peace process. The Trump administration is focused almost exclusively on drugs. Well, fine--funding alternative crops and bringing the displaced back into the formal economy helps with that, but it requires commitment. You hate the FARC? Fine, but never-ending war doesn't achieve much. Bring them into the formal economy and the political system, all the while verifying what they're doing. We can only hope that Trump doesn't care about Colombia to the point that he lets his own officials do the work. Work, incidentally, that is just a continuation of President Obama's policies. 3 days since the constituent assembly vote. In terms of the hemispheric response to the Venezuela vote, there's a sense of taking stock. --Chile announced that two Venezuelan judges had taken refuge in their embassy and might be granted asylum. --Overall, the hemisphere is largely critical but cautious (see this post at Global Americans). It's worth noting, however, that criticism is more widespread than it has ever been since Hugo Chávez first took office. The situation, from a humanitarian standpoint, is already becoming dire. We are evaluating all our policy options as to what can we do to create a change of conditions where either Maduro decides he doesn’t have a future and wants to leave of his own accord or we can return the government processes back to their constitution. Talking off the cuff about regime change doesn't help anything. --Smartmatic, which made the voting machines used in Venezuela, said the vote total was false. This is going to be the sort of situation that involves a lot of small factors gradually coming together. As more evidence of fraud and human rights abuses emerge, more governments will feel empowered to be critical and perhaps even more Venezuelan government officials will feel empowered to speak out against their own leader (which, incidentally, is precisely why you have to be careful about imposing sanctions on lots of people in government). At this point, the Venezuelan government will get the assembly together as fast as it possibly can to impose change before more of the hemisphere becomes more critical. Nicolás Maduro says it'll happen soon. Finally, here's a nice look at the issue of the military, which has to keep order throughout all this. As I've written, Hugo Chávez become prominent in large part because of resistance to Carlos Andrés Pérez using the military to attack the people. Now we've come full circle and at some point one has to wonder whether the rank and file like to keep repressing fellow Venezuelans. 2 days since the constituent assembly vote. The Trump administration imposed sanctions on Nicolás Maduro himself, which puts him on a list of people who are given symbolic sanctions yet remain in power. Maduro responded by referring to Trump's popular vote loss, which is actually something that might get the president's attention. Meanwhile, Canada condemned the vote but is not pursuing sanctions. That's true of a number of countries in the hemisphere. And that's really the problem. Unilateral sanctions aren't going to do much but no one has the stomach to act multilaterally--not just for sanctions but for anything. Back in March I argued that Latin America would not unite and so far it hasn't. Inaction is Maduro's biggest ally right now. The Trump administration can bully and bluster but at best that has little impact and at worse entrenches the Chavista core and makes other Latin American countries more hesitant to jump on board.